It is with great Joy that we announce the official opening of the inclusive Kindergarten at the Peaceful Bamboo Family : Tinh Truc Gia=TTG ; living community and vocational training center for people living with disabilities in Hue, Vietnam. We started officially after Têt, with 10 children, 5 of them, living with disabilities, and we already have a waiting list for the coming months. After the summer we will welcome some more children. This Kindergarten is a pilot project that will serve as a training center for Hue City Kindergarten teachers for the inclusion of children living with disabilities. A group of architecture students, with the help of a local NGO, ACCD, built a wonderful playground on a voluntary basis, mainly made of recycled materials. This Kindergarten is perfectly in line with the vision of Eurasia for the coming years. A new phase has already started that enables us to expand our activities to the overall education system in Vietnam with the Call 2 Care Program. It has started end of 2014 in partnership with the Education Department of Hue Province, MOET(Ministry of Ed. and Training in Hanoi) Hue University and Mind & Life Institute. This program introduces Social and Emotional Learning (SEL) Mindfulness and Compassion into regular and special classes in Hue. A first phase has been completed with a group of 500 children. The first results are very promising and we have a strong commitment of the education department, the teachers, children and their parents to bring this program further. There will be a first evaluation of the program this summer. We are looking for funds for a next phase in which we could improve, further develop and test this new curriculum in the whole Province (about 400.000 children). We are also looking into a collaboration with Geneva and Lausanne Universities to measure the impact of this program and to present it to the Ministry in Hanoi. Our efforts to find support for our work also in Vietnam, is slowly bringing fruits. TTG has no financial support from Vietnamese Government and is dependent on their small production and income generating activities, but mainly on fundraising through Eurasia. 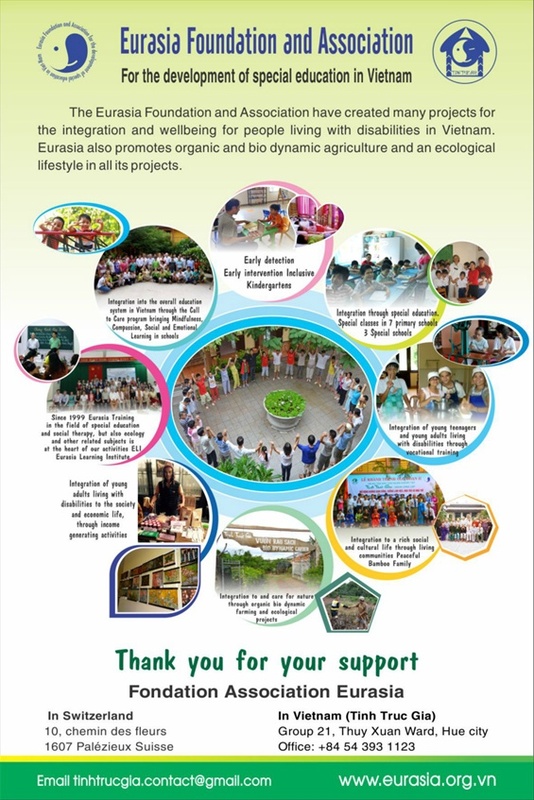 More and more young people, local NGO’s, support our work through selling our products, but also by inviting us to share our experience, knowledge to a wider context in Vietnam. Many volunteers from Vietnam and abroad want to learn about social therapy, biodynamic farming, a lifestyle respectful towards those who are different, who are in need, respectful towards nature and about social entrepreneurship. TTG’s mission clearly is to be a practical training Centre for ELI. The new land of our biodynamic garden in TTG develops new projects: medicinal herbs, a seed-bank in order to contribute to the biodiversity and to generate income for the Center. Khanh the Eurasia representative in Vietnam, develops an early detection and early intervention office in Saigon and Hue. He is giving training to parents and educators as one of the programs of ELI ( Eurasia Learning Institute). Thank you so much for your faithful and precious support! Please do help us to develop the next phase of Eurasia!